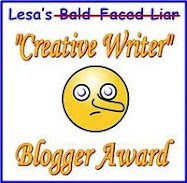 Cozy Chicks: We cook--we bake--and sometimes...we fail! We cook--we bake--and sometimes...we fail! The Cozy Chicks love to cook. In fact, a number of us include recipes in our books. And of course, before we include a recipe in our books, we test them. Sometimes more than once. In fact, just yesterday, I was testing a recipe I want to include in Booktown Mystery #9, that I will start work on come September. So, I spent the morning making the cake; black raspberry cake. It called for a tube pan, but I thought it would look prettier in a bundt pan. Big mistake. As you can see, the cake did NOT want to leave the security of the bundt pan and came out in pieces--about six of them. And the recipe called for it to be baked for between 40-50 minutes. I decided to go halfway and bake it for 45 minutes. My oven is pretty accurate and ... 40 would have been better than 45. It tasted pretty good, but did not look good. And the next time I bake it (and I will bake it again), I think I'll add walnuts. I like a cake with walnuts. It's rare that a book that's been out more than a year gets a review on one of the bigger review sites--but that's the beauty of ebooks--they have a shelf life of longer than a month or year or so. But wait! 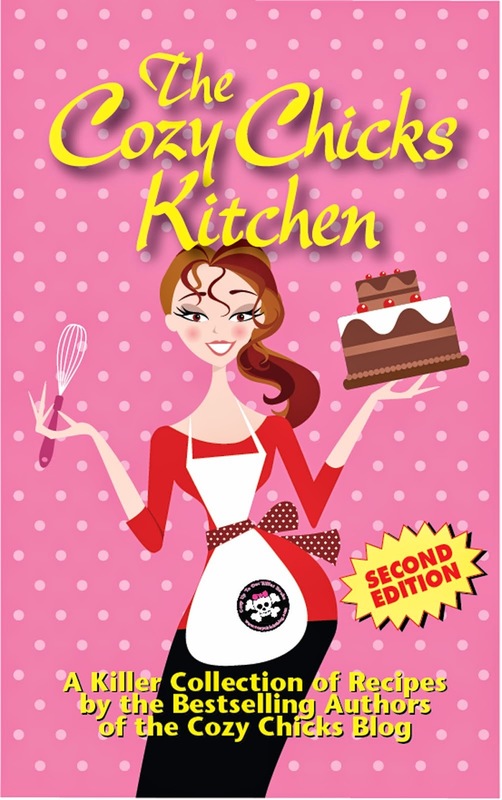 The Cozy Chicks Kitchen is also available in trade paperback. If you haven't already given our cookbook a try, we hope you will. And if you have -- we hope you'll consider writing a review on Amazon, Barnes & Noble, Goodreads, or any other review site. That is great news, and yes those recipes sound delicious! To be honest, I really don't like to cook, though I am not a bad one. But translating recipes is not easy. The measurements are different, and some of the ingredients are just not available here like you buy them in the stores. (And I often review books older than a year, as it is just not possible to read everything the same month it is published, and you find books and series long after they were available). Later today I review Truly Madly on my blog (and goodreads and Amazon). 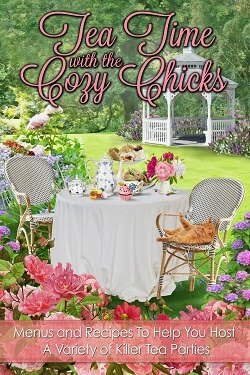 Many of the recipes in The Cozy Chicks Kitchen not only include how to make a dish, but come from the kitchens of our characters. You learn little tidbits about them through the recipes they make and where the recipes originated. I think it's good to remind people that baking isn't a science - sometimes, things don't come up pretty. But boy, I bet that still tasted amazing! Cut me a slice and expect me for afternoon tea! It tasted pretty good. The batter went in purple and came out brown. Go figure! When a cake "failure" occurs, just cover it with frosting, powdered sugar or make a trifle and layer the cake pieces with layers of pudding and LOTS of sweetened heavy cream. It will taste find and look great in another form. Love your books and always look at the recipes in the books that include them. Drizzle! Drizzle! Drizzle! Drippy drizzly icing would look and tase delicious, oh and get your guests half baked as well. Oh, the heck with guests. Invite your girlfriends over!